When looking for a locally owned and operated home security company in the Glencoe area, the first place you should turn is to Alert Protective Services. Our team has provided alarm systems to people all over this area since 1982. In the nearly 40 years, our home alarm company has been in business, we have built a reputation for being one of the best wireless home alarm providers in the state. When we install and monitor your security alarm systems, you can rest assured you receive the highest caliber of customer service. Monitored home alarm systems provide homeowners with the help they need when a burglary happens. As soon as we get a notification your alarm is going off, we will get in contact with local law enforcement and you, the homeowner. Since we are based in Chicago, we are just a stone’s throw away from our customers. This allows our alarm company to react faster when alarms sound. Glencoe is located in Cook Country, on Chicago’s North Shore. It has a population of 8,762. The village itself has strong community values and traditions. Small towns have their own set of problems to deal with, with the major threat being burglary. Many homeowners in smaller communities feel that they don’t need to home security system. This is quite the opposite. Many smaller towns are becoming a target for burglars. 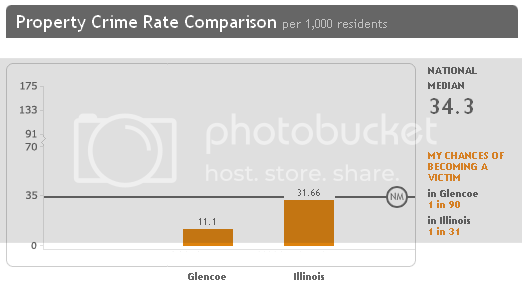 In Glencoe, the average crime rate is 26 incidents per square mile. This is low compared to the national average of 49.6 per square mile. Many of these crimes are property related ones. The property crime rate in Glencoe is 11.1 for every 1,000 residents, or 1 in every 90 residents will become a victim of property crime. Last year alone, there were 102 total crimes reported, 98 of which were property related and the other 4 were violent crimes. It is easy to determine that the real concern is the possibility of property theft. One way to protect yourself against this threat is to have the professionals at Alert Protective Services install a home security system. This will ensure the safety of your home and more importantly, your family. A recent FBI study found that homes with a home security system are 15 times less likely to be burglarized. Are you looking for a technologically advanced home security alarm with mobile phone capabilities? Alert Protective Services can provide you with the interactive home security system you need for a great price. We offer video doorbells, smart thermostats, security cameras, surveillance cameras and much more. Being able to access home security systems via a mobile device allows homeowners to check in on things while they are away. Being able to find out what is going on at your home can give you the peace of mind you need while on vacation or away on business. Even if you have no idea what type of security systems are available for your home, we can help. Our team of well-trained home security system professionals will not rest until we find the ideal system for your home. Don’t delay, give Alert Protective Services a call today to find out more about the services we can provide.